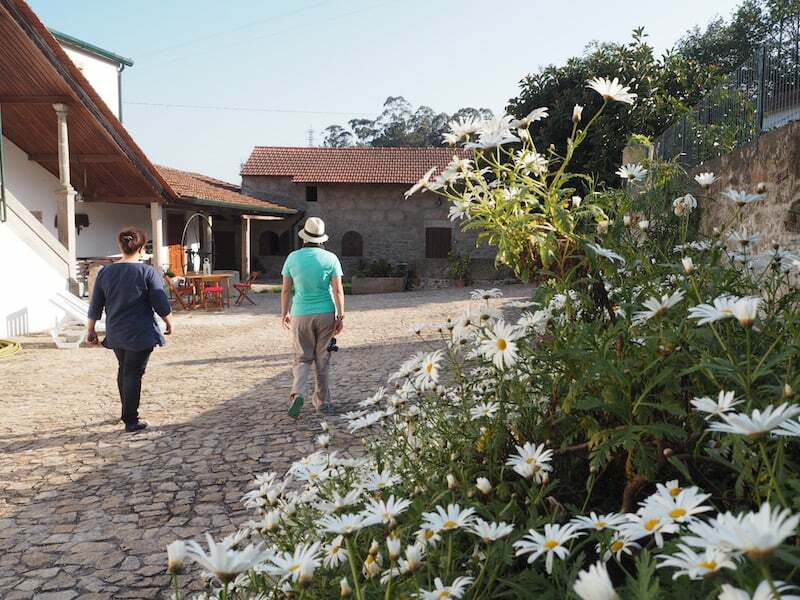 Pilgrims on the Portuguese Way of St. James: Food & Accommodation in Portugal. Like in real life. My journey along the Portuguese Way of St. James (13 days, 260 kilometres walking) has changed my life. Once more. In a very healthy way, I believe. I know, for instance, that I do want to “go back” to walking for a week or two more often, in order to refresh the mind & soul. I also know that I do want a certain type of luxury doing that. Now let me explain what I mean by this. 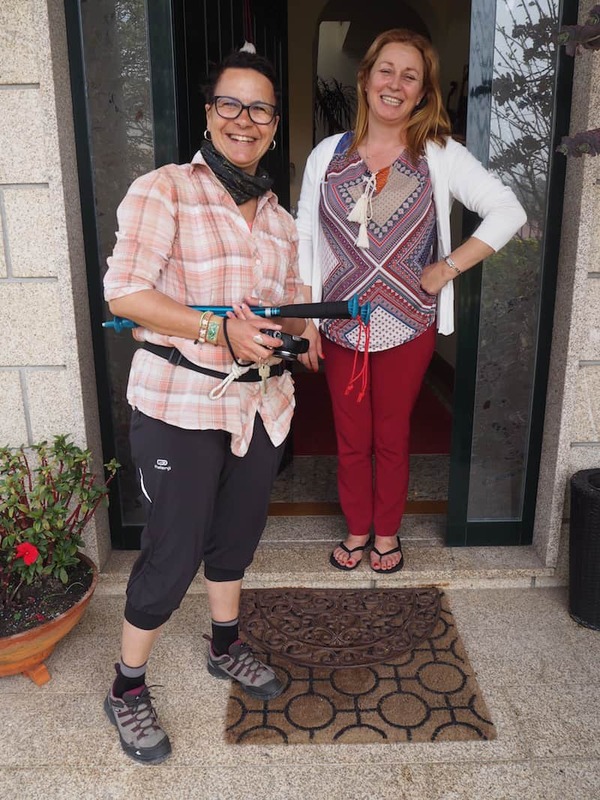 My dear friend & co-Camino blogger Rita Branco always mentioned, while walking from Porto to Santiago: “Basta sofrer no caminho ..” – “It’s enough to suffer along the Way, walking ..”. 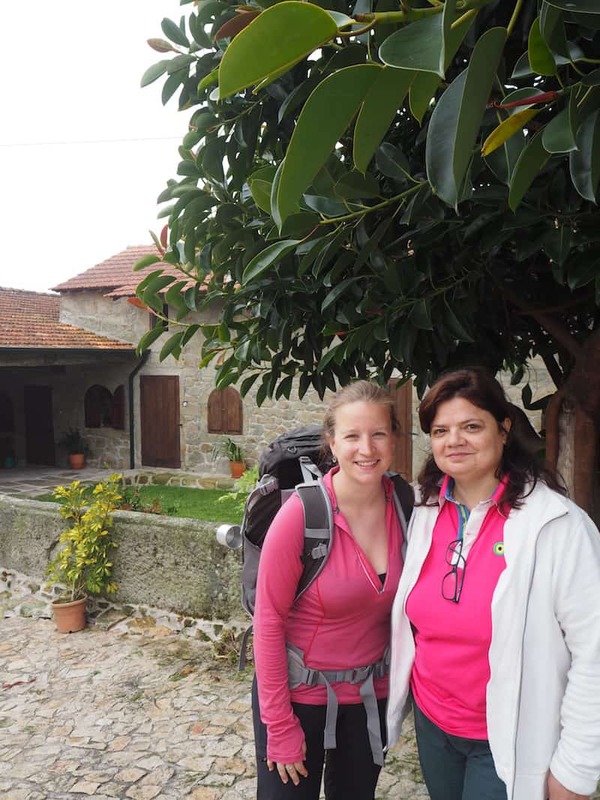 Prompting her to use her strong networks in the north of Portugal as well as in Galicia to research a whole host of diverse and interesting Camino accommodation alternatives to the standard pilgrim hostels, from hotels, to bed & breakfasts as well as apartments, for making our way to Santiago. It’s the early 21st century. Digital influencers are ruling the world. Why not on the Camino? I admit, it does sound a bit off, all this new age digital marketing stuff while walking a very ancient pilgrimage route. 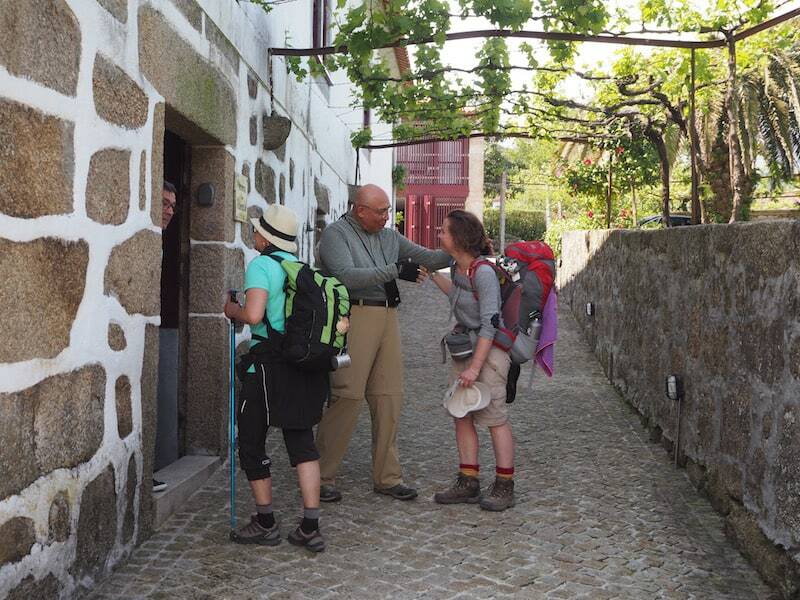 “So, you are on the Camino blogging, using Snapchat and Facebook … and they have invited you everywhere? 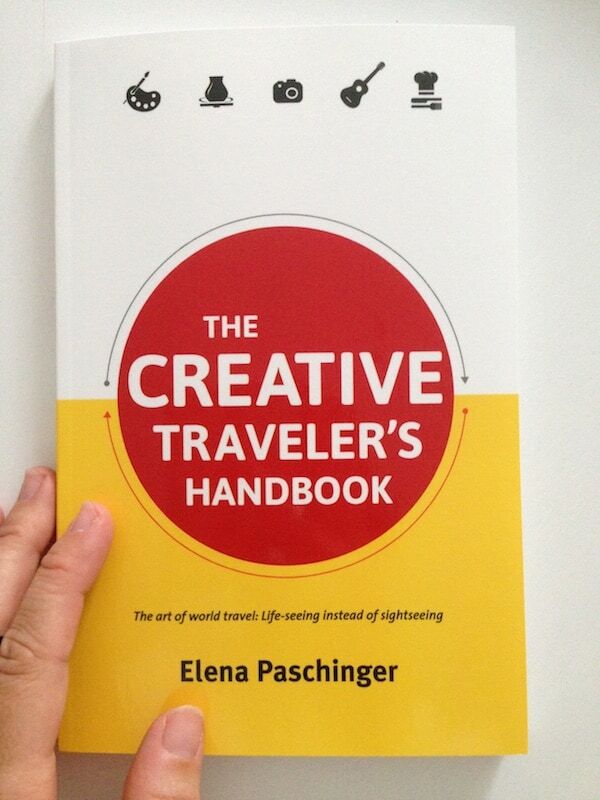 !” Very often, I remember Rita and I having to smile, explaining to other pilgrims what we do as professional travel writers and bloggers, which in case you are interested is summarised here: http://www.slideshare.net/CreativeTourism/duas-bloggers-um-caminho. 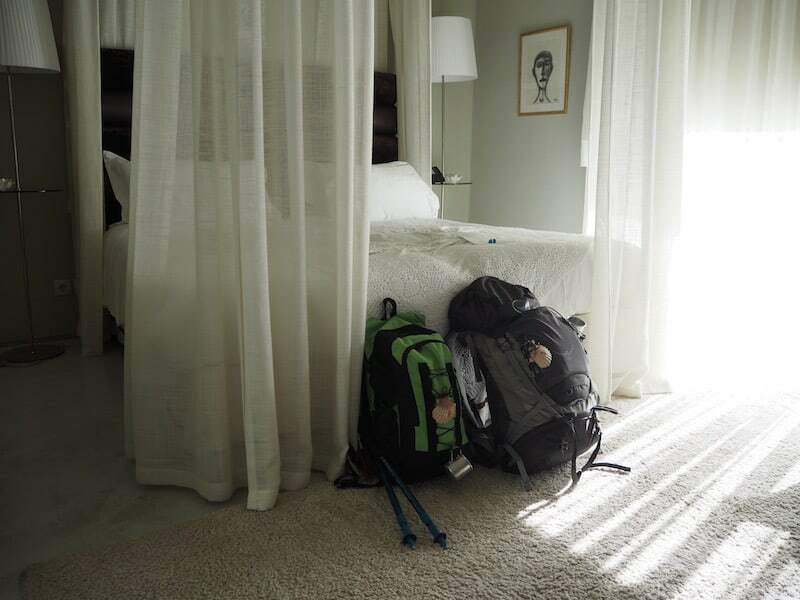 All of this has resulted in us being able to recommend you everything but pilgrims’ hostels. Don’t get me wrong, there’s nothing wrong with them per se: It is just that we wanted, searched for & came up with something completely different. For us two, it has always been about: Arriving, relaxing, having peace. A room on your own or just the two of us. Sleeping well after the physical strain of walking for so long. Just retreating for an hour or two, not having to say anything to anyone. Meeting such nice hosts, who put so much time, love and attention to detail to everything, miraculously dishing up the most delicious breakfasts and/or dinners for us. 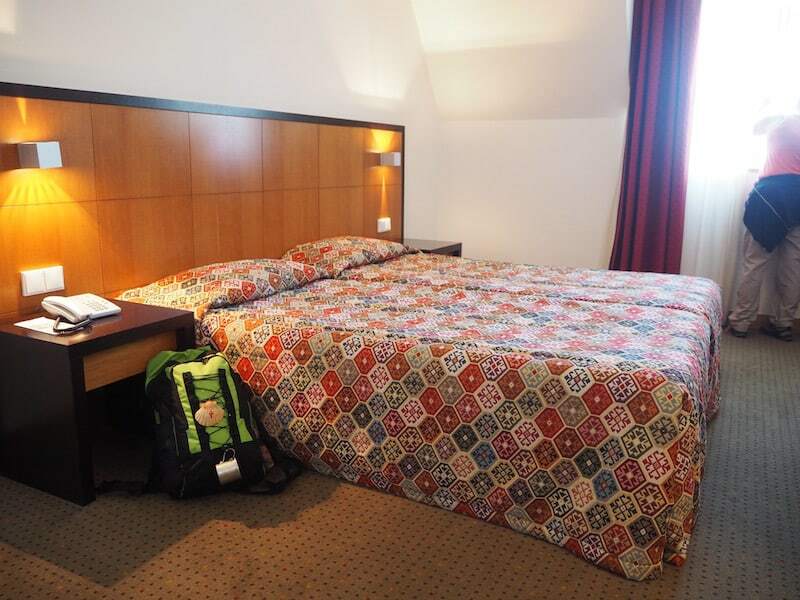 Honestly and truly: Most of the accommodation we stayed at in Portugal & Galicia didn’t cost so much more than the standard pilgrims’ hostels, either. What they do offer, however, is a lot more comfort and style. Trust me (and Rita), when we say: “Basta sofrer no caminho ..”! Have a look at the map below for a better overview of where exactly we stayed in the north of Portugal. 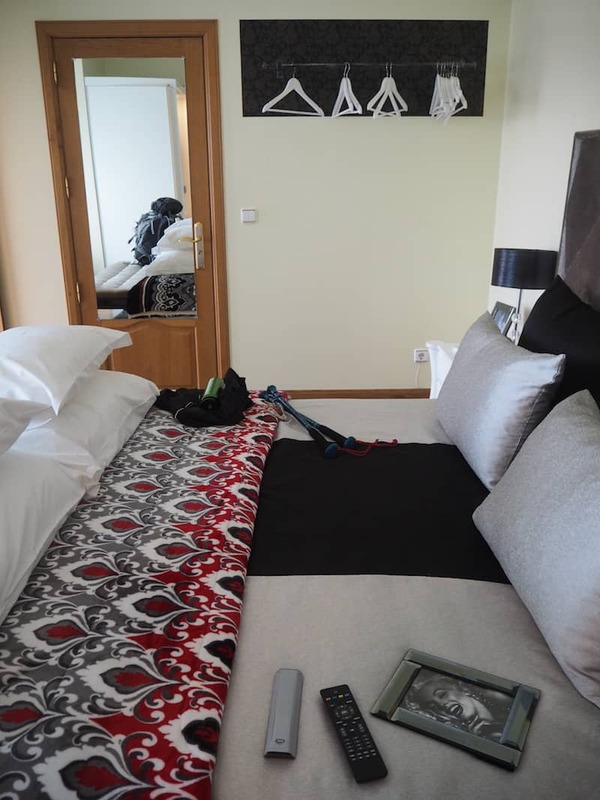 The second part of my article about food & accommodation along the Way talks about more charming places to stay in Galicia, the north-western most part of Spain: Hidden gems for sure, and not only while walking the Camino. This time, though, let us continue in the north of Portugal. 1. Casa Mindela Guesthouse in Gião. 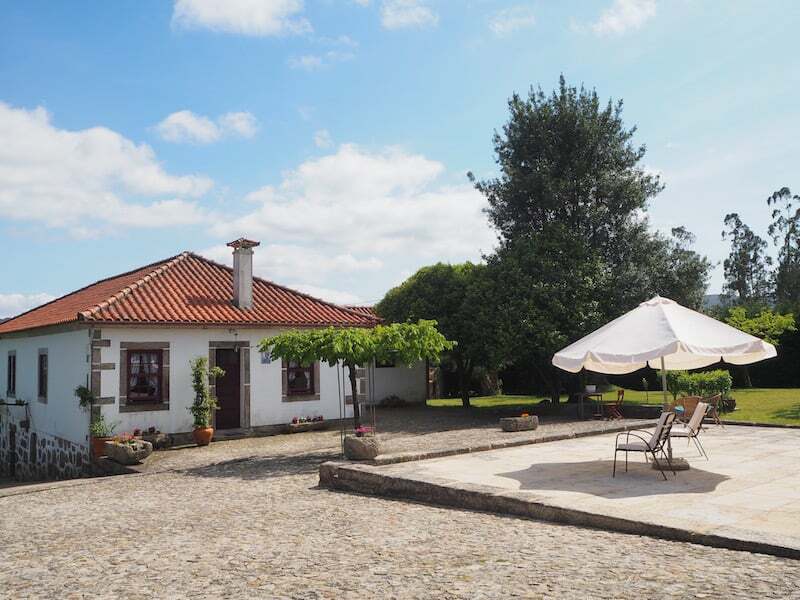 A charming country house of a kind, located right on the Way of St. James, some 22 kilometres north from our starting point, the Cathedral Sé in Porto. 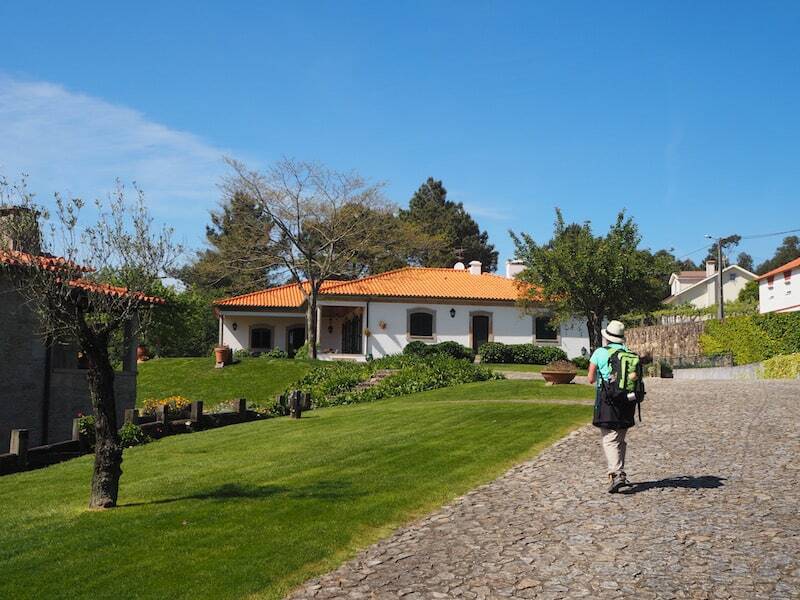 It makes for a perfect break and wonderful retreat from the strains of walking the first day on the Camino, or might simply double as your next accommodation choice when wanting to visit Porto but stay out on the countryside. 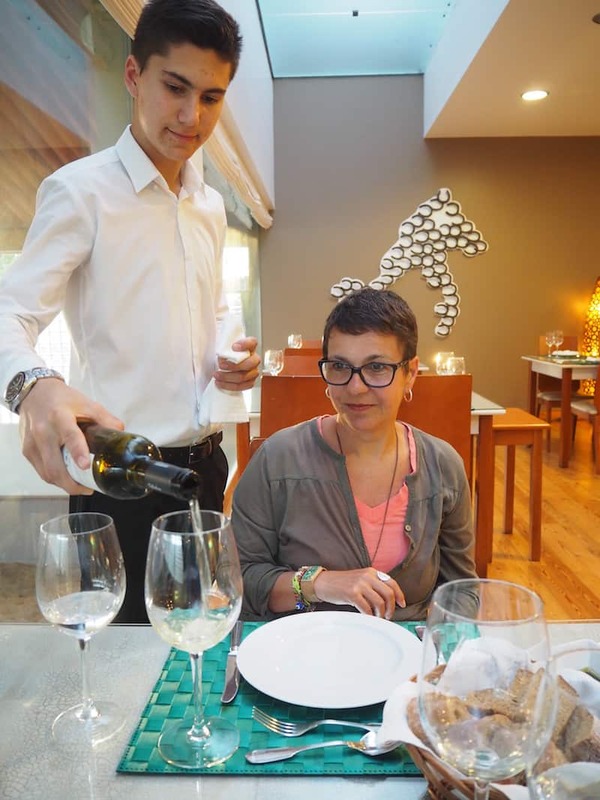 Our host, Helena Duarte, is a warm-hearted woman, who speaks English, French & of course Portuguese fluently. She has managed to turn her parents’ farm into a spot-on, state-of-the-art country residence with a lot of attention to detail. As pilgrims, we simply delight in being welcomed by her. … before taking a seat at the family dinner table (yes, it’s Portugal folks: No one will ever leave this country hungry!). … thank you so much, dear Helena, for such a warm pilgrim’s welcome !! Rita has also published about Casa Mindela on her blog; and you can refer to Helena’s website for all further information here. 2. Hotel Villa d’Arcos in Arcos. “Only” 12 kilometres later, the end of our second day walking the Camino was called Hotel Villa d’Arcos, in a small rural town by the same name. We were able to arrive relatively relaxed, enhanced by the hotel’s own garden pool as well as the happy dinner shared with other pilgrims. It is here where we met our first “companion spirits” along the Way, with pilgrims joining us from countries such as Germany, the USA, England or Canada. Friendly faces during all of our arrival moments in walking the Camino: Priceless. 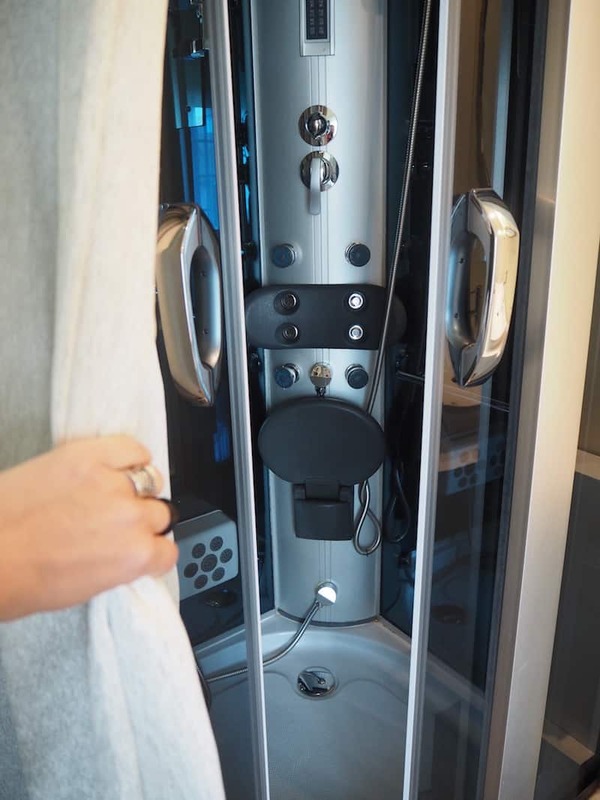 … and even offer a surprisingly handsome “spa shower” for the #luxurypilgrim in us !! Not to mention the view from the garden … “If walking to Santiago does not work out, I’ll try swimming instead”, is what I post later that day on Facebook, amused. 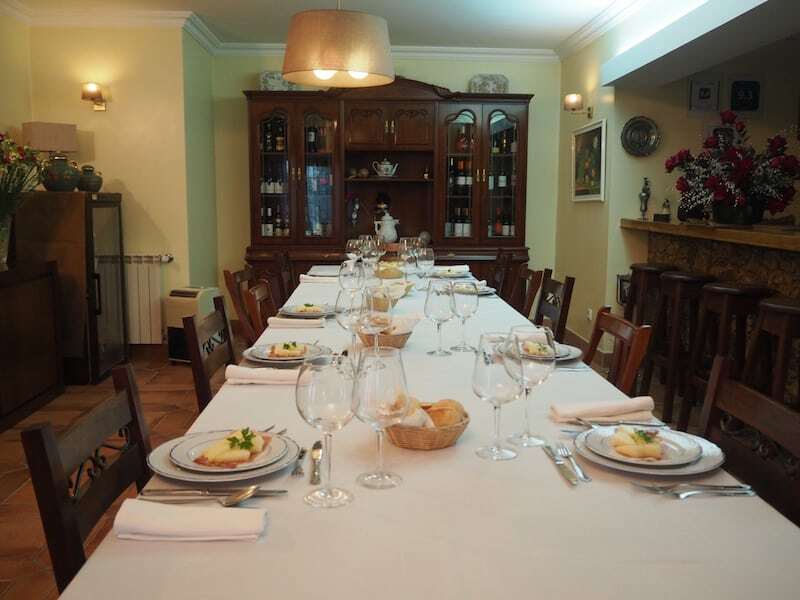 In the evening as well as in the morning, for dinner and for breakfast, this carefully laid table is waiting for us. Another big bonus of staying where all meals are served: Not having to move an inch after x kilometres of walking. 3. Hotel Bagoeira in Barcelos. Our third Camino day led us some 19 kilometres further north into the city of Barcelos, known all over Portugal for its legendary rooster (“o galo de Barcelos”). After being welcomed by the local head of tourism, we checked in to Hotel Bagoeira, offering us peace and a perfect retreat: I haven’t felt all too well that day (talking about a sun stroke as well as the accumulated effort of the first few days walking), only able to enjoy the city in passing and really only “waking up” recovered after breakfast the next morning. Well, my dear: That, too, is the Camino. You can’t always feel 100%. 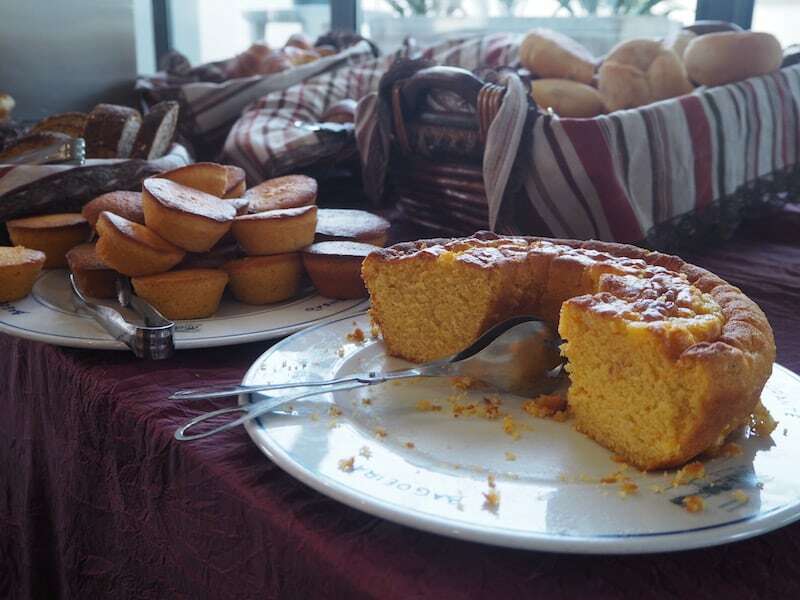 … breakfast with a good piece of cake like this gets me going again! Barcelos, you will see me back in better conditions ! 4. Quinta da Cancela in São Lorenço, Guimarães. 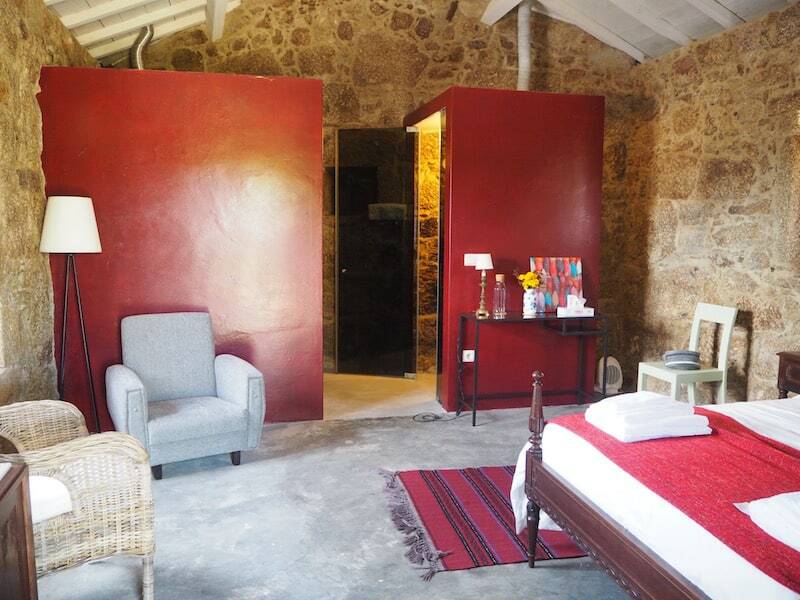 One of my personal highlights along the Portuguese Way of St. James is the historic country house “Quinta da Cancela” with its beautifully decorated rooms, combining modern creature comforts and traditional ways of building in the most ingenious way possible. 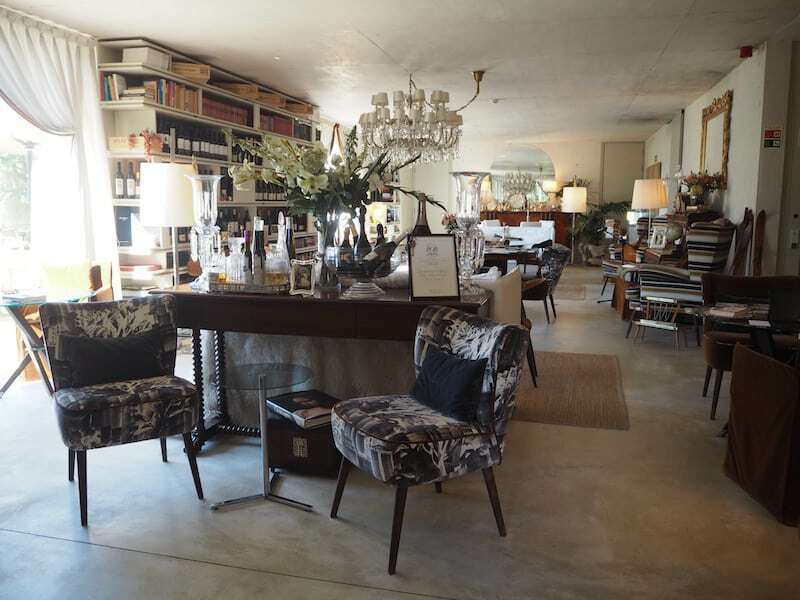 Like at Casa Mindela, history meets passion for detail, both in the furniture as well as in the food provided. Breakfast and dinner are both being served by our host and his colleague here: A true feast for the senses, located once more right on the Way of St. James (we can see the yellow arrows pointing to Santiago from our bedroom window that night). … combining past and present in a very attractive way. 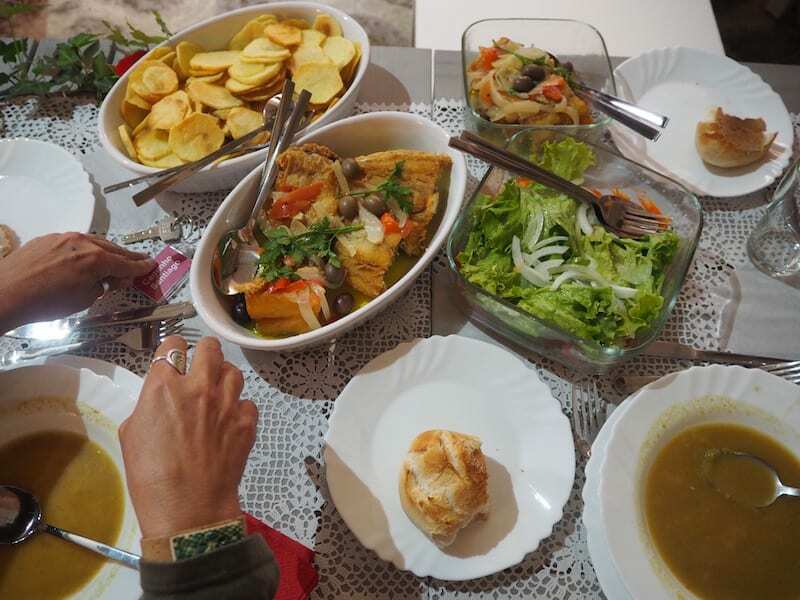 … dinner, too, gets very picturesque here: We are being served home-made vegetable soup, followed by “Bacalhão” (codfish) with potatoes, salad & vegetables. 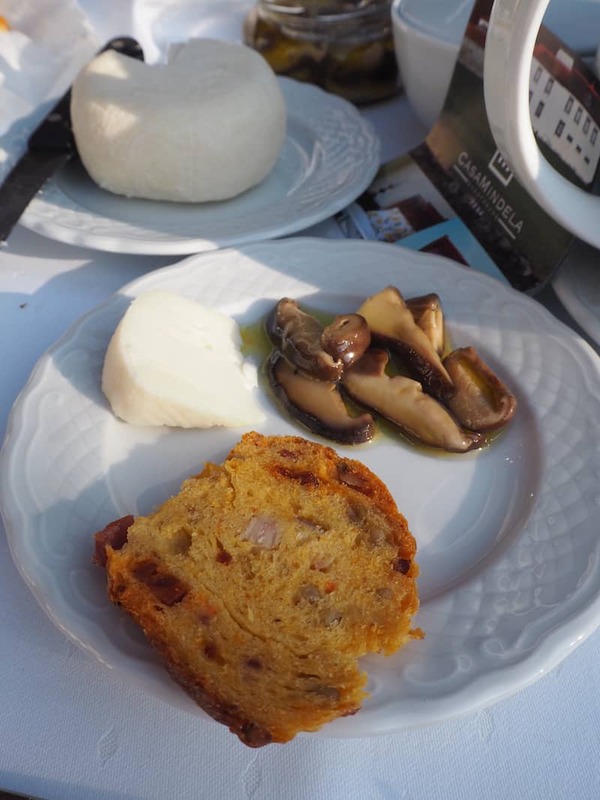 A true feast delighting pilgrims from near and far: “Merecemos” – We deserve it, after yet another 20 kilometres of walking that day! 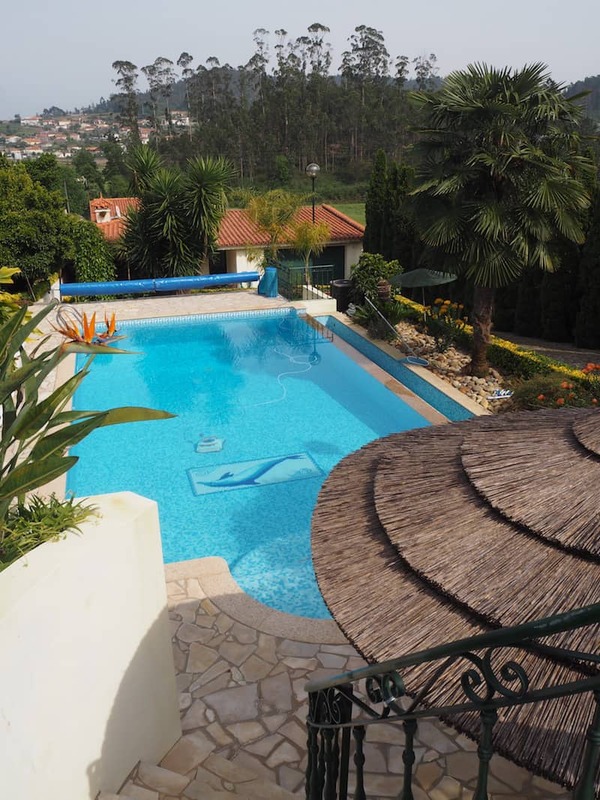 Check out more about “Quinta da Cancela” here. 5. 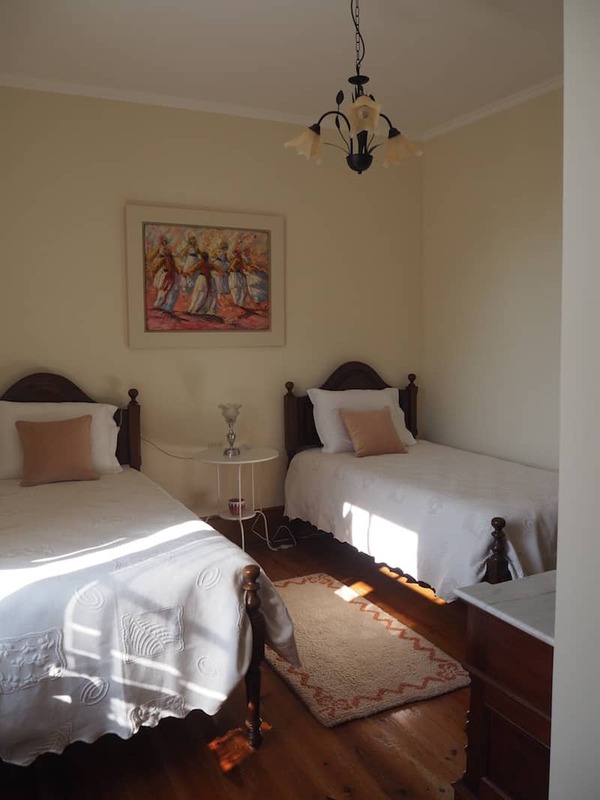 Carmo’s Boutique Hotel in Ponte de Lima. Extraordinary. And truly unique. 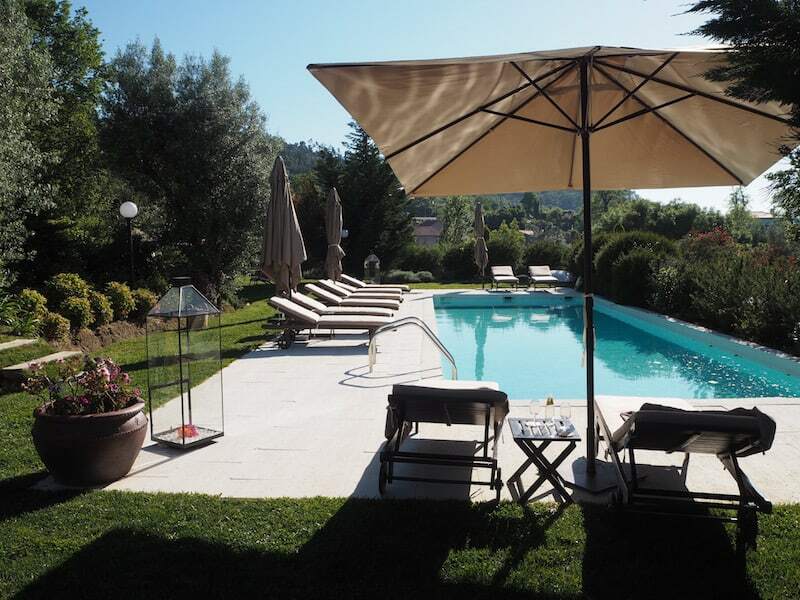 Our most luxurious accommodation along the Portuguese Way of St. James has been “Carmo’s Boutique Hotel” near the city Ponte de Lima. As one of the “Small Luxury Hotels of the World”, it is renowned far across the borders. Interestingly enough, there have always been pilgrims here, too, making our functional wear and Camino backpacks seem less odd in such a glamorous environment. Besides, it’s the hotel team’s warm-hearted welcome that has us forget all the physical strain of walking here once more. … where we get to relax and appreciate our luxurious surroundings for the day. 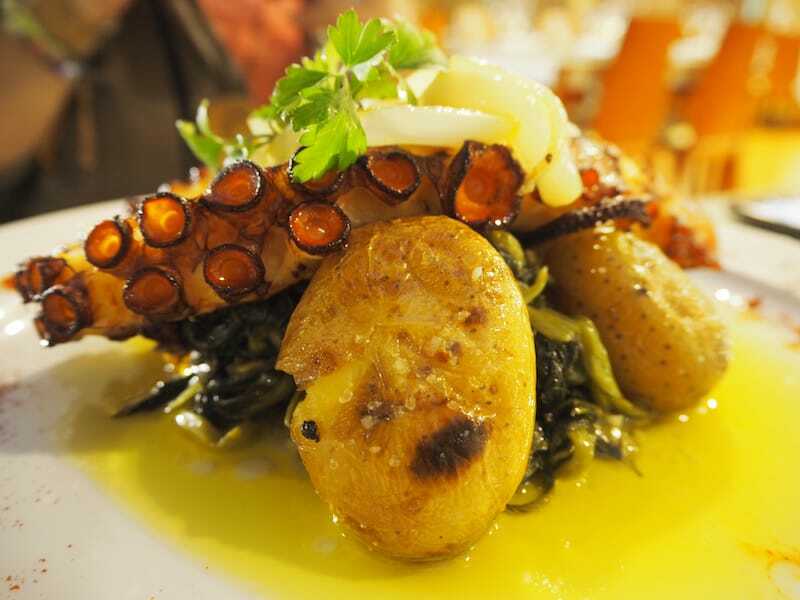 … don’t miss out on the “pulpo” octopus here! 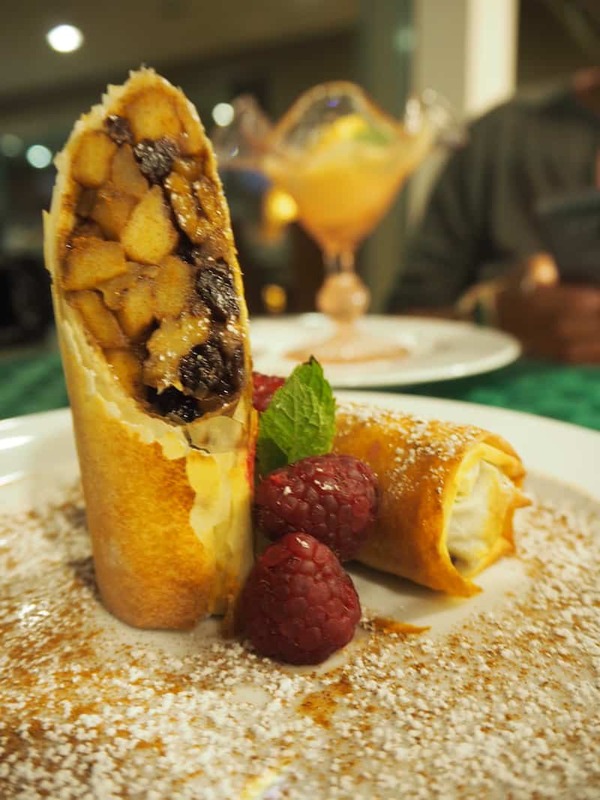 For dessert, I am surprised to find this Portuguese interpretation of a truly Austrian dish, our famous apple strudel! Yum. 6. Casa da Oliveirinha in Aqualonga, Paredes de Coura. ‘Tis the day of our “mountain hike” along the Portuguese Way of St. James. 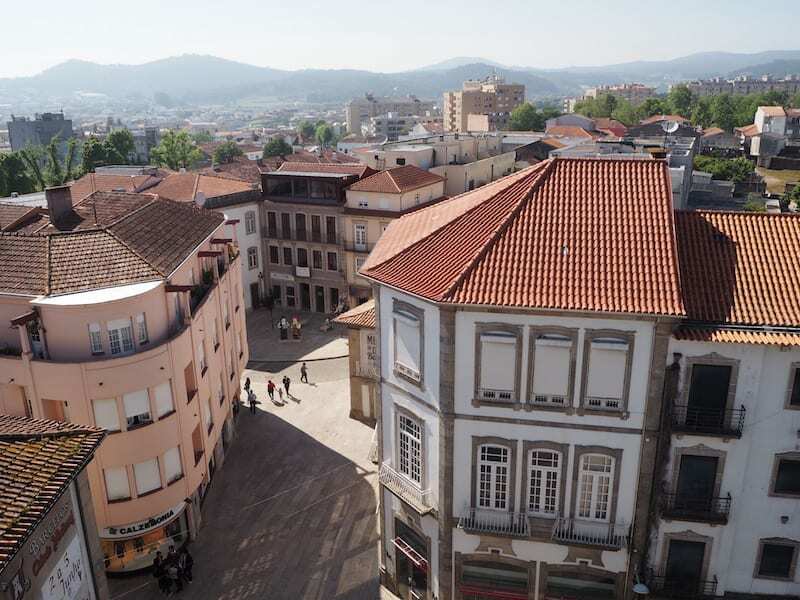 After leaving the city Ponte de Lima behind, the day rolled out with yet another 20 kilometres’ walk and some 400 – 500 metres of difference in altitude, heightened by the blistering heat of a perfectly sunny day. Thank God most of the Way that day turned out to be in the shade; I nevertheless remember arriving at Zezinha’s house, the nick name of our charming host Maria José as if a) it had been yesterday and b) it had been a Fata Morgana in the desert. By then, we had walked more than a 100 kilometres, up and down hills and across the land requiring all of our mental and physical forces. 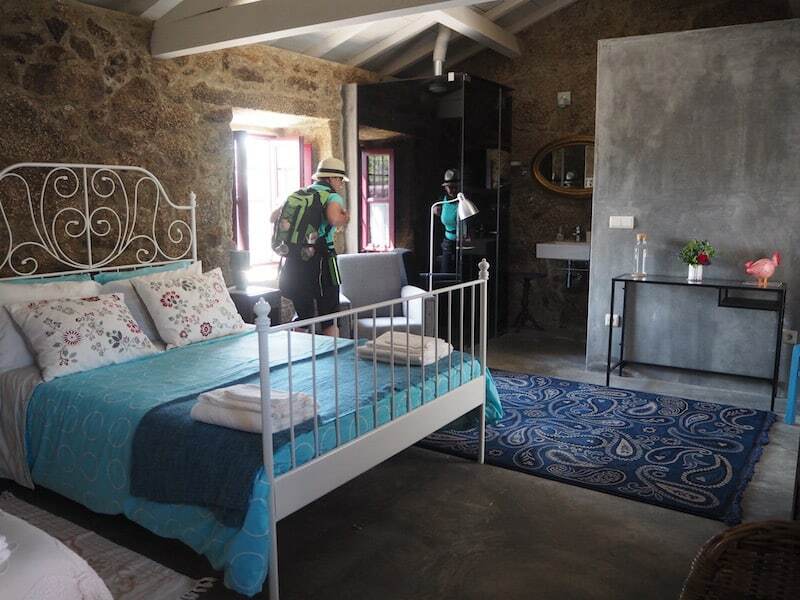 Which might be exactly why I will never forget staying at Casa da Oliveirinha, the “House of the Little Olive Tree”. So much that I already know I will return there one day. Check this out. … the house offering a lot of love and attention to detail. 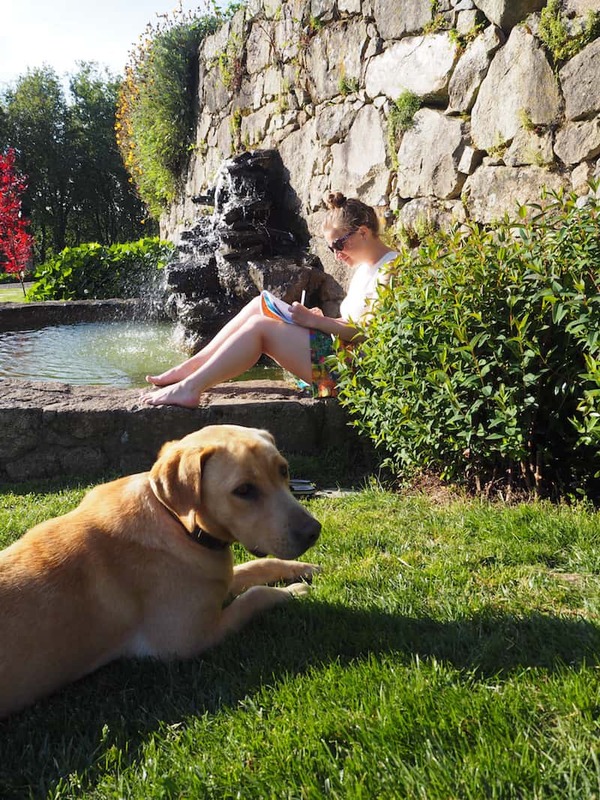 Priceless moment(s): Writing in my Camino diary in the lush green garden, protected by the family dog. And here, our meeting of a kind: From left to right with my dear friend Rita Branco, our host “Zezinha” (second on the right) as well as “the Americans” Ruth, Patti & Tina from Colorado. 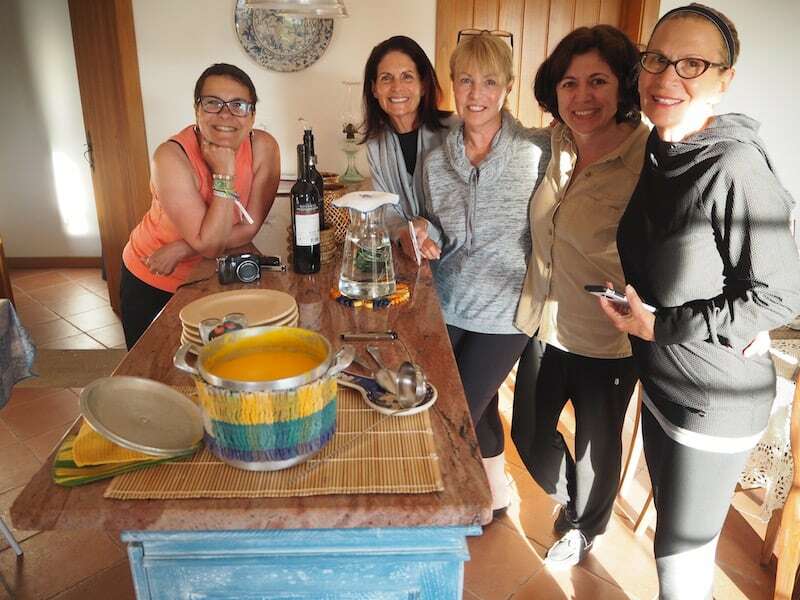 What a friendship for life, the magic of the Camino truly in full swing. 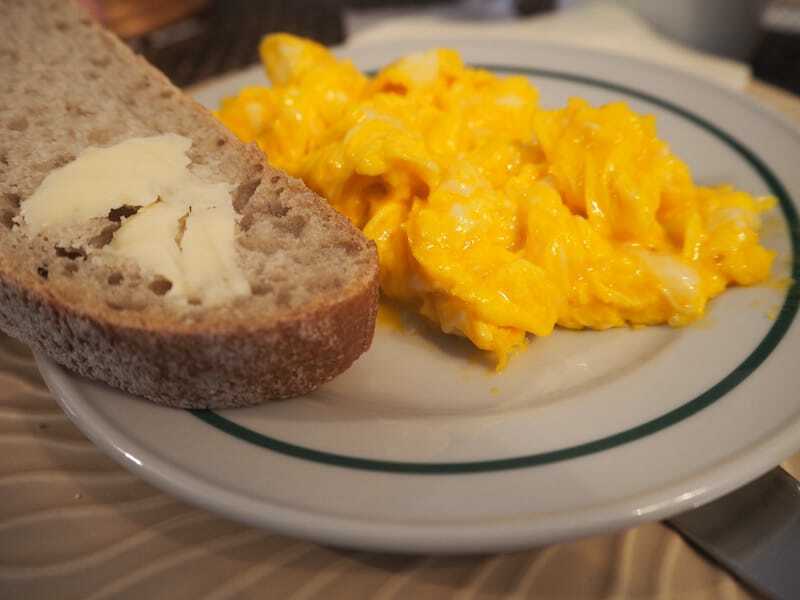 Last but not least: Who could resist eggs of this beautiful, intense yellow colour, fresh bread of such a smell, or homemade butter ..? 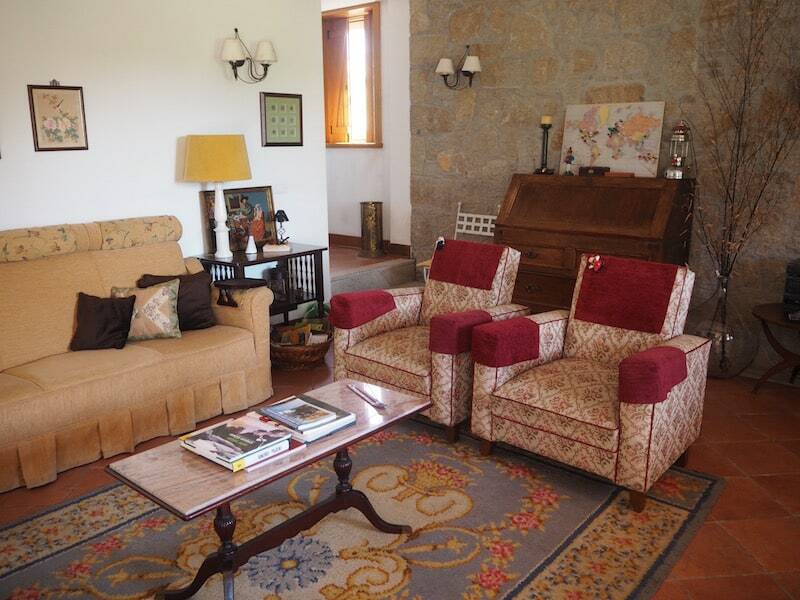 Find out more about “Casa da Oliveirinha” including pictures, Facebook & more here. My dear companion friend & pilgrim blogger Rita Branco has also published about the Camino on her blog, “O Porto Encanta“, in her truly light-hearted and captivating way: “Do Porto para Santiago de Compostela: Uma experiência incrível.” Check out all articles she has published about the Camino here: “O Caminho Português de Santiago” . 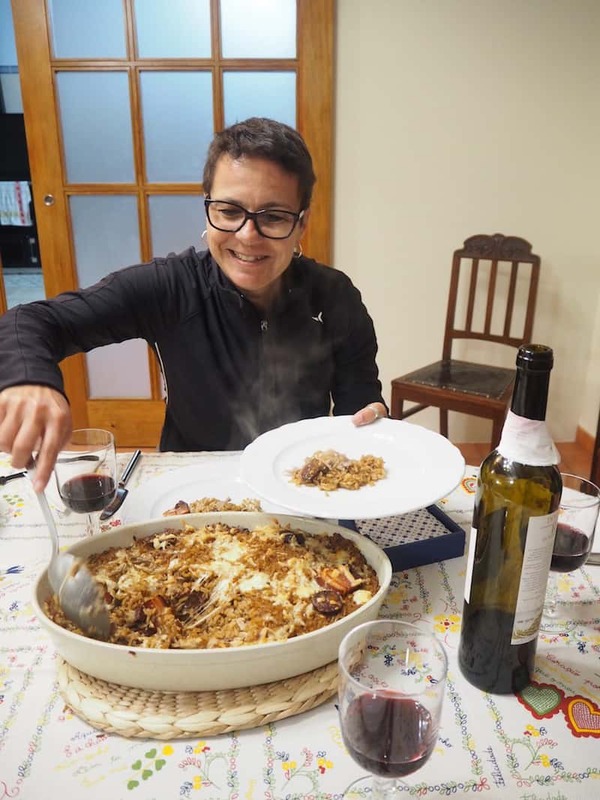 Besides, English expat blogger, writer & translator Julie Dawn Fox has also published the following articles about the Portuguese Way of St. James here. Disclaimer: We wish to thank our partners & accommodation providers along the Portuguese Way of St. James for their generous support. All opinions are my own. Preparing for the Way of St. James in Portugal & Galicia: 10 Travel Tips for getting on your Way.